Dicentra cucullaria is one of only 20 species of hardy herbaceous perennials from within the Dicentra genus. 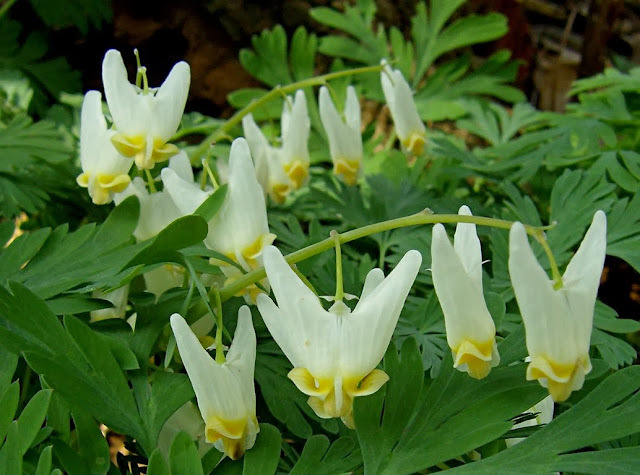 It is a graceful plant which produces arching sprays of pendulous, pure white, yellow tipped flowers in May and June. It is a native to the woods of eastern North America, with isolated populations in the Columbia River Basin. These western populations have sometimes been separated under the different name of Dicentra occidentalis, because they display coarser growth. It grows to a height of around 6 inches but produces its 1 inch long flowers on flower stalks up to 14 inches long. 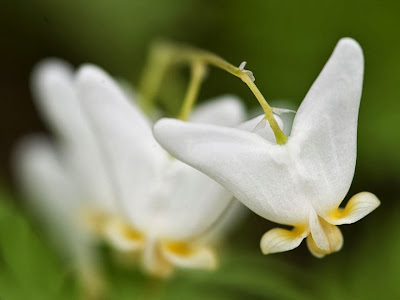 Its has a couple of common names, notably 'Dutchman's Breeches', but the most appropriate is the 'Falling Angel' which reflects the bi-lobed, wing shaped flower. With a little imagination they really do look like upside-down angels falling to earth. Interestingly, the 'Falling Angel' has an unusual and 'less than angelic' way of propagation by seed. The seeds are spread by ants, in a process called known as myrmecochory. Each seed is contained within a fleshy organ, known as an elaiosome, which is attractive to ants. The ants collect the seeds and taken to their nest. They eat the elaiosomes, and afterwards remove the seeds which are taken and deposited in their nest debris. Here they are protected from being eaten until they germinate. They also get a head start by growing in a convenient 'compost medium' made rich by the nest debris.